It is time once again for the annual Turkey Party! This party supports to efforts of the Redwood Gospel Mission and The Salvation Army Santa Rosa Corps. The Redwood Gospel Mission and The Salvation Army Santa Rosa Corps have joined their Thanksgiving and Christmas efforts to help those in need of a helping hand. 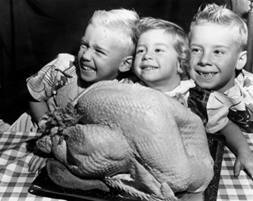 The turkeys will be given out during the Great Thanksgiving Banquet of Wednesday November 21st. Members of the Redwood Gospel Mission and The Salvation Army will be at the party to accept cash donations also. Admission to the party will be two frozen turkeys. Come to the party and stay for a short time or as long as you wish. See your friends. We also request that you bring you favorite appetizer or beverage to add to the party. Be a part of our community helping those who need a helping hand. There is no requirement to RSVP, just come by and drop off your turkeys and join the party. Contact Wayne if you are unable to attend, yet you want to make a donation. Call Wayne at 707-486-0786. HINT: Safeway and some other grocery stores put turkeys on sale just before Thanksgiving. Last year the price was $4.99 each. This may be a great way to purchase the turkeys.